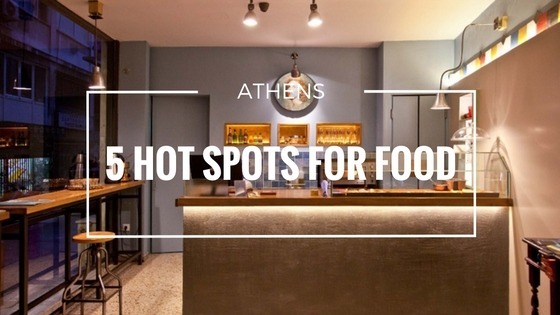 Hungry while discovering Athens? This will certainly not be a problem, as Greece’s capital is known in the later years for rapidly transforming into a top culinary destination, with numerous gastronomic choices are that are sure to please every palate. The following list features some of the hottest spots all true foodies swear by. Hidden in a small corner behind the busy Aiolou Street, Feyrouz is reportedly home to the best lahmajoun in town. The stuff will welcome you warmingly and the nostalgic smell of spices will enthuse you, much like the wide selection of the traditional eastern goodies, all fresh out of the oven. Tip: If strolling around has left you empty pocketed, this place will definitely hit the spot – deliciousness under 3 euros per item. Yum. Having a sweet tooth? A small, elegant pastry shop at the feet of Kolonaki awaits you to taste amazing french-inspired desserts. Soft croissants filled with praline, sophisticated pastries topped with fresh cream and fruits, delicate macarons and sinful chocolate gateaux are perfectly accompanied by premium quality coffee, teas in all varieties and the amazing signature hot chocolate. Tip: The salty options are also to die for – go for that quiche along with a glass of good wine. What about a small detox after all the souvlaki fest during your visit? Avocado near Syntagma square is one of the top vegetarian and vegan destinations in town, frequently preferred even by meat lovers who adore the great variety of healthy, colorful plant-based dishes. The menu features pasta options, pizzas, mains, side dishes, fresh salads as well as a great selection of juices and smoothies. Tip: Do not miss the raw chocolate tart – the agave syrup works miracles. Located towards the end of Ermou Street, just before Thiseio train station, Mirch has become an instant favorite by lovers of ethnic cuisine -and not only. With its spicy delicacies and hip atmosphere, this Indian restaurant serves delicious food with an innovative touch. Besides the traditional dishes, the spot’s hit is the Indian version of the greek souvlaki, a mouth-watering naan pita filled with juicy tandoori chicken, vegetables and creamy sauce. Tip: Cool off the spiciness with a cold beer from their updated selection – ideal on a hot summer day. As you walk down the busy Kolokotroni street, it’s almost impossible to ignore the colorful corner of Etnico; it’s uplifting atmosphere will cheer you up while the menu will travel you from India all the way to Arabia – and even Mexico. Delicious falafels, samosas, quesadillas and burritos await for you to dig in, while there is an interesting selection of desserts and alcoholic beverages available. Tip: Do try the chimichanga – it is divine!